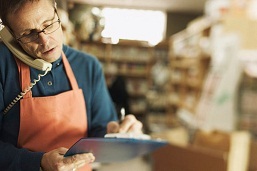 The start of 2012 is upon us, which means small businesses are scrambling to minimize their tax expenses before the end of 2011. Timing is everything – and strategically scheduling the way you report your income and expenses at the end of the year can save your business some extra cash. Below are five tips for reducing the amount your small business will owe in taxes. 1) Wait until 2012 to bill your clients for December. This enables you to defer the payment on those taxes for another year, and saves you a little bit of cash in the short-term. The only exception to this tip is if you have any concerns about getting paid, the taxes you’d save aren’t worth the delayed invoice. If you have any cash flow concerns, collect your payments as soon as you can. 2) Buy as many office supplies that you think you’ll need for 2012 while it’s still 2011. That way you can qualify for higher the 2011 deductible rate. The only exception to this is a prepaid expense that extends beyond 2012, such as a subscription or membership fee. 3) If your business expects a profitable year for 2011, you should consider establishing a retirement plan that qualifies for the extended due date in the 2011 tax code, which would give you more time to fund the plan. 4) Buy all the exotic equipment you think you might need (and can afford) for 2012, and make sure to use it before 2012. If you actually use your equipment before 2012, you can claim a full write off using the Section 179 (“Expensing”) deduction for pre-owned property. The dollar limit for 2011 purchases is $500,000. 5) Reconcile all your payable bills. If you have bills piled up that aren’t due until 2012, you can deduct the expenses under the 2011 code if you pay them now. The only exception would be if you don’t have the cash, but you may even consider charging the expenses to your company credit card, which is tax deductible in 2011 – even if the credit card bill isn’t due until 2012. You only have a few days to implement these changes, so contact your CPA or other tax advisor as soon as you can to determine whether these or other last-second decisions can help lower taxes for your situation. I would like to encourage small businesses to get serious about improving their marketing with a focus on increased sales and leads – not fuzzy metrics that don’t mean much like how many followers you have. Most of them just are not using social media well, their content is NOT answering the questions their potential buyers have or offering the solutions they need (essential to conversions), and they are not even positioning themselves where their target audiences already are (besides being on Twitter, Facebook and/or Google+) which are good but are NOT targeted unless YOU intentionally focus on your potential clients. Few consultants or agencies are doing this right, either. You need to know who to listen to (like Hubspot, Marketing Experiments, Bryan Eisenberg, Dr Peter J. Meyers, Steve Krug – and many others). And you especially need to know who to ignore – which is much of the most popular advice. Most of it is based on what works for Big Brands or is a way to part you from your money that does not generate a positive ROI – and especially does NOT work well for SMALL businesses.